Signing the MOU are (L-R) Michael Brose, director of the East Asian Studies Center, Trisha Adams, assistant director of research contracting in the IU Office of Research Administration, and David Dong, interim director of the education division in the Taipei Economic and Cultural Office in Chicago. The Taipei Economic and Cultural Office in Chicago has signed a memorandum of understanding with the East Asian Studies Center in the Indiana University School of Global and International Studies to support the scope of Taiwan studies at IU. David Dong, interim director of the education division for the Taipei Economic and Cultural Office, signed the MOU in Bloomington on August 10. 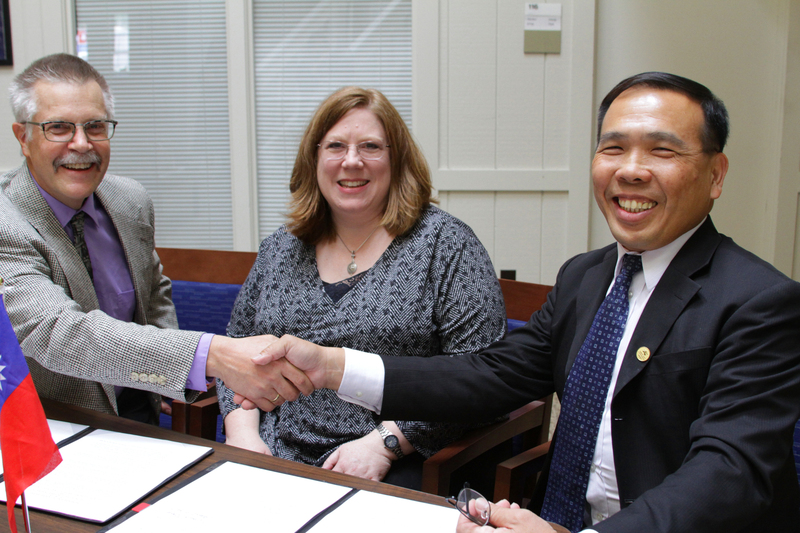 The agreement supports a number of activities to expand Taiwan studies, including developing the undergraduate course “Taiwan Between Empires,” as well as graduate student and faculty travel and exchange of scholars. Part of the support from the Taipei Economic and Cultural Office will also support a Taiwanese legal scholar visiting the IU Maurer School of Law. The agreement just signed is for a year but may be extended. Support from the Taipei Economic and Cultural Office is being matched by IU research funds. Other provisions in the MOU include screening two Taiwan documentary films as part of EASC’s Documentary Film in Post-Authoritarian Societies series as well as supporting participation of a Taiwan film scholar in a series-opening roundtable discussion. A visiting Taiwanese scholar invited by EASC will come to IU to give a public presentation as well as address students in the Taiwan Between Empires class.